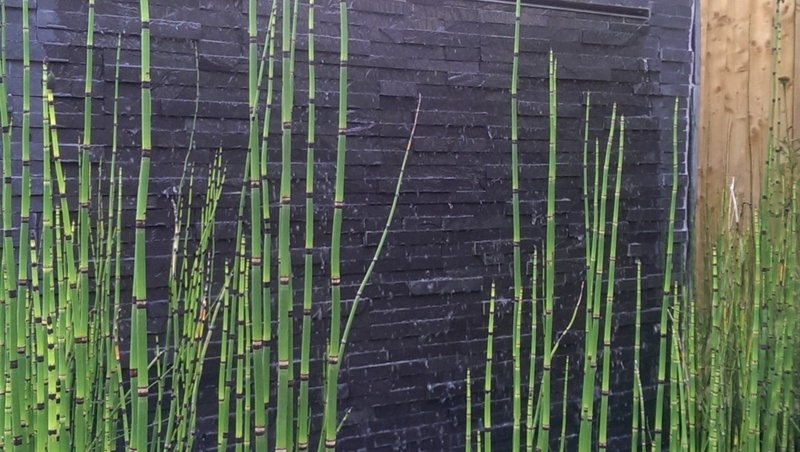 If you have been doing the rounds of show gardens this year you may of noticed the use of Equisetum hyemale. I used this plant in abundance at my Grand Designs show garden last year (perhaps I’m a trend setter, not a follower). It is a stunning evergreen plant that likes to be kept wet and is ‘very’ happy to be permanently submerged in water. Why do I like this plant so much? With leafless, single stems up to 4ft in height this plant is more architectural than flouncy and used correctly works as a great focal point in any garden. Once the weather warms in Spring you can almost watch the stems rise with glorious different shades of green. From almost a lime to a deep green colour. Being evergreen it provides much needed winter interest. When the garden has done its thing and died back this plant will continue to draw the eye and provide enjoyment. Used in design Equisetum hyemale provides light screening. It is one of those great plants you can use to create partitions in the garden. Still being able to see through it but drawing the eye away from the garden boundaries in turn making the space feel larger. Plant Equisetum in a semi shade to sunny position. A good 3 hours of sunlight a day is enough to keep this plant looking great. This plant is invasive and will spread in open ground so plant it in a large plastic container or trough and bury. Consider planting in a modern, contemporary planter for maximum effect. Equisetums thrive and survive in constantly wet soil or submerged so don’t forget to water regularly if planted in soil. Another great place to plant this tall specimen is in balcony planters. Balconies often have unattractive balustrading & walls, this plant is the perfect foil!